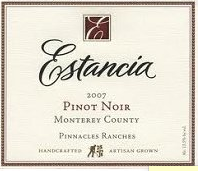 This enjoyable Central Coast pinot noir we enjoyed (okay, several of them) with Christmas dinner with the Heuseveldts and both Ma and Steve. My brother had picked this out previously and knew it would definitely be a hit while we celebrated the holiday. I think the delicious spread included the pinot, a perfectly cooked prime rib, smashed potatoes, a cheesy-cauliflower vegetable medley that Ma prepared, some scrumptious breads, and a light but tasty green salad (with dried cranberries!) that Laura had whipped up. I didn’t actually remember to shoot the bottle until after we left our hosts’ house so I’m guessing on the year based on what I presume Steve paid, and this label is from an online source rather than showing our actual spread. It was a fun and delicious wine to accompany our fun and festive dinner–the only shame being that we didn’t have more than the three (3) bottles to enjoy! I don’t see this offered downstate here in NJ as much as I do up in Rochester but I’d gladly buy and drink it again!